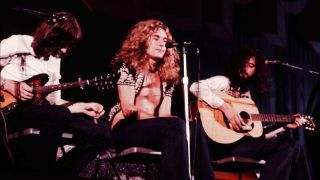 The four members of Led Zeppelin had been continuing their journey, which led them with this song to the shores of the Pacific. Just as Page’s laid-back music is reminiscent of Californian folk rock, Plant’s lyrics extol the West Coast spirit: flower power and the counterculture and creative excitement that were at their zenith in the sixties. It is a song dedicated to “the days when things were really nice and simple, and everything was far out all the time,” to borrow words addressed to the crowd by Robert Plant at one of two concerts given by the band in Berkeley, California, in September 1971. The first-person narrator has taken the decision to make a new start and to abandon "a woman unkind". The line "Someone told me there’s a girl out there with love in her eyes and flowers in her hair" evokes Joni Mitchell, who, since leaving her native Canada, had occupied a place on the Californian avant-garde musical scene both as a musician and as a symbol of the counterculture. This reference in the form of a tribute is corroborated by the beginning of the fourth and last verse: "To find a queen without a king, they say she plays guitar, cries, and sings" is surely an allusion to I Had a King, the first song on Mitchell’s debut album (Song to a Seagull, 1968). Going to California is the second track on the album - after The Battle of Evermore -with no contribution whatsoever from John Bonham. Indeed, this superb acoustic ballad is performed by strings (two guitars and a mandolin) and voice alone. It seems to have been recorded exclusively at Headley Grange, using the Rolling Stones Mobile Studio, with no overdubs added at Island Studios. "Going to California was a thing I’d written before on acoustic guitar,” explains Jimmy Page. The track opens with Jimmy Page’s acoustic guitar. He is playing (fingerpicking) his Harmony Sovereign H1260 in open-G tuning (D G D G B D). Before long, John Paul Jones joins him on his C. F. Martin A-style mandolin (stereo left). The mood is bucolic, pastoral, and very British. Robert Plant’s lead vocal then begins, gently, tenderly. Plant’s performance is delicate and intimate, an impression accentuated by the total absence of reverb. His special gift is to be as at home singing ballads as he is performing the most unbridled rock number. Coinciding with Plant’s entry, Page adds a second part on his Harmony Sovereign (on the right), which combines finger-picking, licks, and chords. The harmonious blending of the three instruments is a real triumph, and in fact an instrumental version of the song can be found on the second CD of the deluxe edition of the album, giving a sense of just how well Page and Jones complement each other. In the middle section of the song (from 1:41), the tonality changes from major to minor, hooking the listener all the more effectively as Robert Plant now adopts a powerful, high-pitched voice enhanced by generous, deep reverb. He then resumes his more soothing tone in the following verse, this time coloured by light, short reverb. Finally, the outro ends with a fade-out, the instruments on the same D chord while Plant’s reverb-drenched voice can be heard in the background (from 3:19).